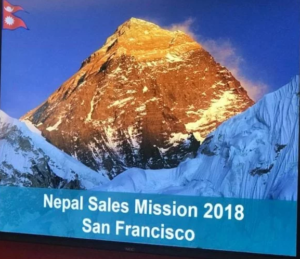 Tourism for Nepal took on a new high when Nepal impressed San Francisco in an engaging tourism event titled ‘Nepal Sales Mission 2018 San Francisco’. The event saw the presence of 92 journey brokers, tour operators and San Francisco journalists who spent an informative and thrilling night at a beautifully-designed San Francisco America India Foundation (SFAIF). During the event, the Director for Tourism Marketing and Promotion of Nepal Tourism Board (NTB) Nandini Lahe Thapa narrated an eye-opening story about her home country to the members. The story was received well by San Francisco travel professionals who loved listening to her and enjoyed the presentation displaying stunning videos of the Himalayan country. Tourism Marketing & Promoting Department Senior Manager Diwakar Bikram Rana co-represented NTB at the event. Four of Nepal’s top tour operators were engrossed in talking about the diverse tourism packages for Nepal to San Francisco agents. The event that witnessed some important persons from both countries Nepal and San Francisco was organized by Dmytro Makarov from eTurboNews (eTN) Haleiwa, Hawaii and eTN Publisher Juergen Steinmetz. Melanie Webster from eTN California was ‘Master of Ceremony’. 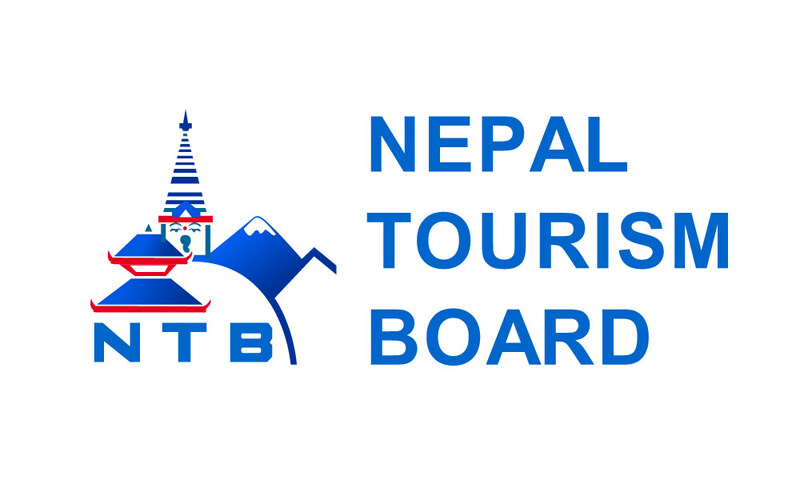 In another important event held between June 14-17, 2018, NTB, Nepal Airlines Corporation (NAC) and four tourism companies represented Nepal in the global events and exchange programs for the 32nd International Travel Expo (ITE) & the 13th MICE Travel Expo. NTB Director Mani Raj Lamichhane and Officer Pradip Basnet represented NTB while Sr. Officer Indira Khadka and Officer Nayan Sharma represented Nepal Airlines. Nepal’s booth at the exhibition attracted hundreds of visitors including affluent travelers who were presented with theme travels and briefed about the national campaign ‘Visit Nepal Year 2020’. In his talks with the visiting press at ITE, Lamichhane mentioned about the Nepal Government’s declaration of 2020 as Visit Nepal Year and its target of receiving 2 million tourists to Nepal. The Nepal Government hopes to receive double the visitors to and from Hong Kong SAR. He also asked reputed travel media from Hong Kong SAR to disseminate positive news/features about Nepal. Nepal Gastronomy was also briefed. Nepal companies participating in the event included Scenic Nepal Adventure, Trekker Nepal Pvt Ltd and Sathi Nepal Tours & Travel. 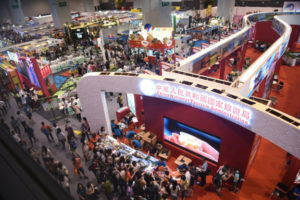 The International Travel Expo (ITE) in Hong Kong is the city’s only travel fair and is a combination of MICE (Meetings, Incentives, Conferences and Exhibitions) and theme travels. leisure, visitors of trade, professional and affluent FIT. The ‘670-exhibitor’ event features about 100 highly popular travel seminar in regular days as compared with 30 travel and MICE seminars on trade days and draws up to 200 audience. The organizers held the event for trade and other professional on June 14th and 15th and for the public on June 16th and 17th. Nepal Tourism was also a center of focus at the Los Angeles Summit. “This feels like stepping into Nepal for a few hours” says Rico, a Los Angeles based travel agent who visited the Nepal Sales Mission 2018 Los Angeles. 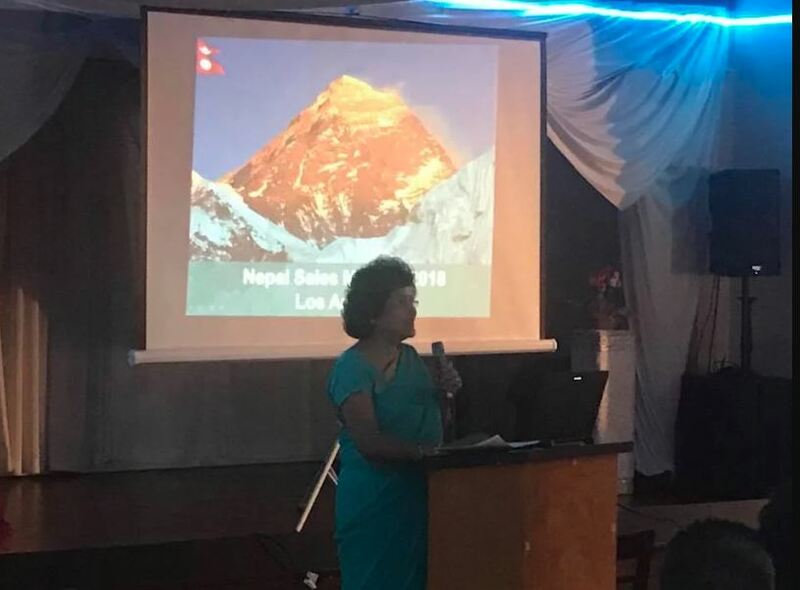 The summit which created a lot of hype for Nepal Tourism in the US ended on the evening of June 27, 2018 at Tara’s Himalayan Cuisine, Los Angeles. In a special occasion and ambience that made people feel like they were in Nepal, the Nepal Tourism Board warmly welcomed, the Honorary Consul General of Nepal, Rishi P. Dhakal and his special guest, one of the dignitaries of the Artesia City Council originally from Nepal. The summit presented a wide range of ‘new’ product development to showcase and promote honeymoons, destination weddings, community volunteerism, yoga/wellness, experiential travel, accessible travel and food/culture in Nepal. Through this summit, the Nepal Tourism Board wanted to convey the overall message of ‘discovering culture, heritage, food, wellness and romance products made available to high per diem US Travelers to Nepal’, to the US media.